In the last Sharpshooter I presented a summary of last year’s income and expenses. 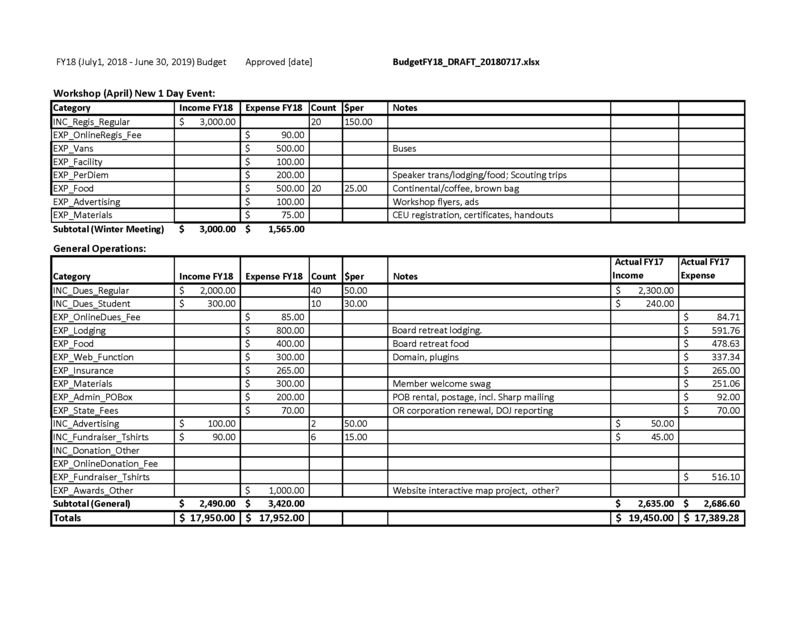 The OSSS Board has developed a budget for this year (Fiscal Year 2018, 7/1/18 – 6/30/19). The Board will vote on the budget in September and is requesting review and comments from the membership. A few notes: OSSS income and expenses can be divided into those associated with putting on events and those associated with general operations. The budget reflects this and groups expected income and expenses by “Summer Tour”, “Winter Meeting”, “Workshop” and “General Operations”. Workshop is a new event starting this year. It is a one day event intended to provide technical training that qualifies for Continuing Education Units (CEUs). Annual operating expenses tend to be more fixed while event income and expenses are estimates based on best information and past experience. 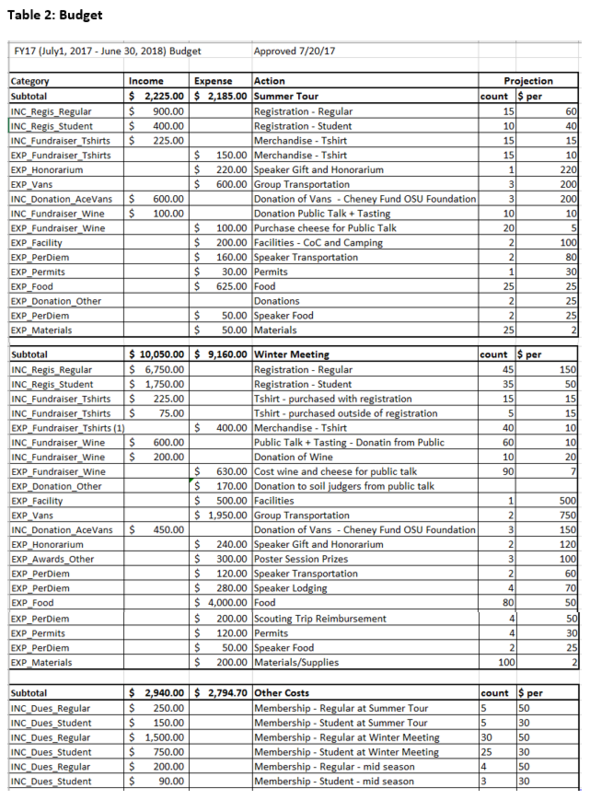 Event expenses are covered by registrations while regular operating expenses are covered by member dues. Please contact osss.treasurer@gmail.com or osss.pres@gmail.com if you have any comments, suggestions, or just want to tell us we are awesome. In 2011 the Oregon Society of Soil Scientists (OSSS) was incorporated in Oregon as a not-for-profit charitable organization. Last year we completed the process by applying for Federal tax-exempt status (501c3). We were approved Oct. 31, 2017. This means that people can take a federal tax deduction for donations to OSSS. Also last year we finished the OSSS Financial Controls, Policies and Procedures. This document details financial practices to deter mismanagement and provide appropriate oversight. The OSSS tracks financial transactions in a single, simple spreadsheet. Pivot tables are easily made to summarize by date range or finance category. The only OSSS bank account is a checking account with Umpqua Bank. We have two debit cards, held by the President and Treasurer. We use Stripe to process payments made on the OSSS web site and make weekly deposits to our bank account. The following three tables contain information about OSSS finances. Below are descriptions of each one which will hopefully help your understanding. Please don’t hesitate to call me if you have questions or concerns. Table 1: FY 16 (July 1, 2016 to June 30, 2017) Summary of Income and Expenses. The fiscal year (FY) for OSSS starts in July and ends in June. Therefore, FY16 (ending 6/30/17) is the last fiscal year. This table summarizes income and expenses for the entire year. It was prepared 6/30/17 and is fixed at that date. Income came in as lump deposits so could not be split out as it is now. Table 2: Budget for FY17 (July 1, 2017 to June 30, 2018). 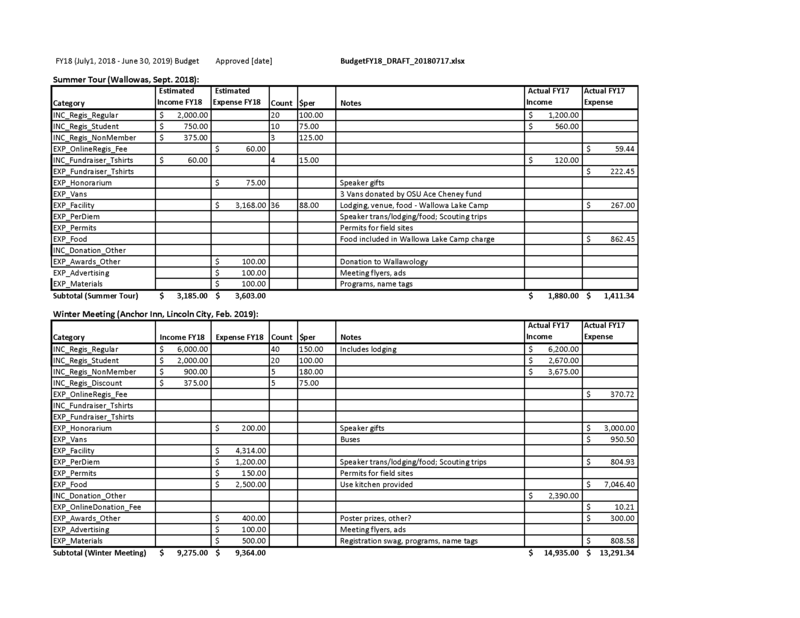 In this table you see projected income and expenses for the current fiscal year. Income (INC) and expenses (EXP) are categorized and standardized so that meaningful summaries and comparisons over the years can be made. The budget is split by Summer Tour (2017) Winter Meeting (2018) and Other. Additional description and information is provided under the “Action” column. The budget was approved by the board on 7/20/2017 and is fixed at that date with the exception of a minor increase approved by the board on 2/5/18. Table 3: Income and Expenses to date for FY17. The current fiscal year ends on June 30,2018. This table is a copy of the pivot table in the OSSS general ledger which keeps a running total of income and expenses to date for the current fiscal year. The majority of income and expenses for the 2018 Winter Meeting have not yet come in.